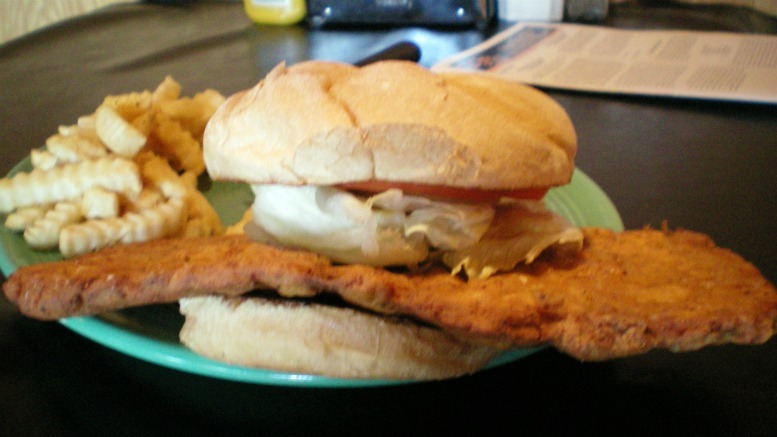 My travels around Iowa eating sandwiches has taught me that many places claiming to have a "famous" sandwich are in towns a little more famous for something else. 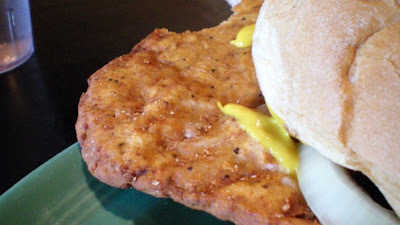 According to their menu, this tenderloin was mentioned by a host on WHO Radio as being the best in Iowa. 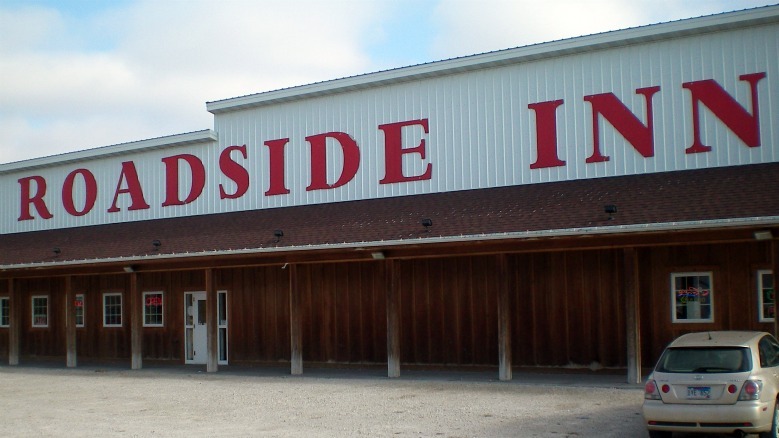 Martensdale has recently become locally famous for Martensdale-St. Mary's High School and their prolific baseball team which has won over eighty games in a row in a streak still going as this blog post goes to print. 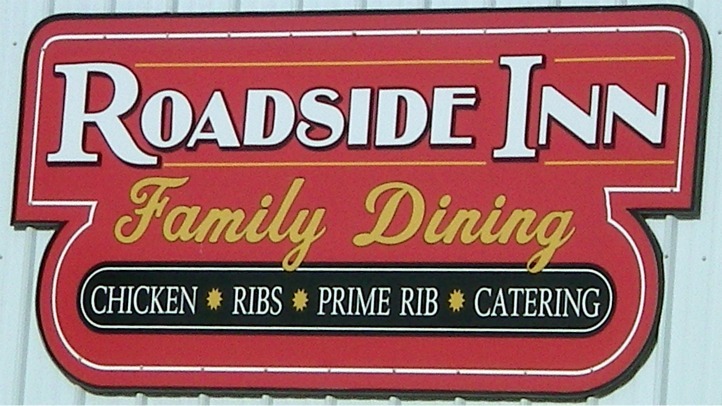 Location: 325 N Highway 28 in Martensdale, about ten miles south of Des Moines in Warren County. Directions: Take the HWY 92 Bevington exit East from I-35, or Highway 28 south from Norwalk. 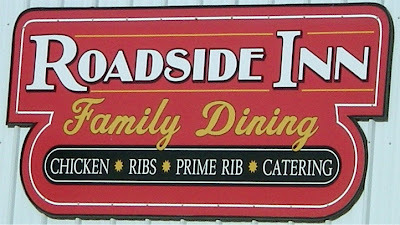 Look for the giant signage, but ask the hostess "Is this The Roadside Inn?" upon entering just to make sure. 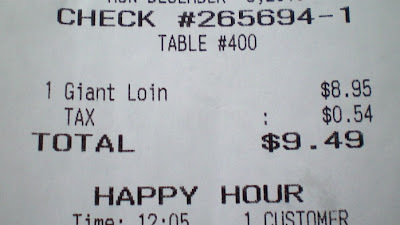 The "Famous Giant Loin": This thing was huge, it cam out on a plate covering both parts of the bun and the side of french fries. I could taste some seasoning salt and black pepper in the breading which stuck to the meat well but never had any crunch. The pork had good juiciness and was moist even at the edges that stuck out beyond the center. The fat hadn't been completely trimmed they way I like it. 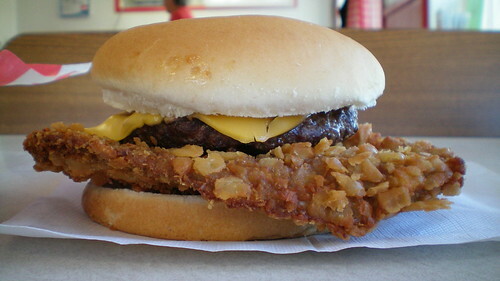 Served with your choice of fixings on a flour-dusted bun. Overall 8.2 out of ten. Also on the menu: Huge menu with broasted chicken, steaks, ribs, sandwiches, salads, hand dipped onion rings, and more that I didn't write down. Service: Its table service in the dining area, or counter service at the bar. Ambiance: This is an old building renovated a few years ago. There is a dining area with booths and a bar area with seats and a counter. The decorations are mostly for local sports teams. 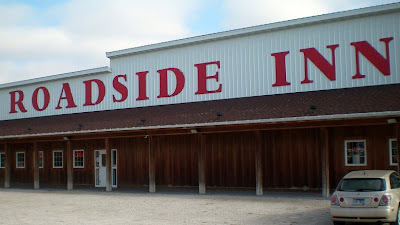 Final Thoughts: The Roadside Inn is a classic Iowa side of the highway roadhouse with gravel parking lot and lettering that can be seen from outer space. 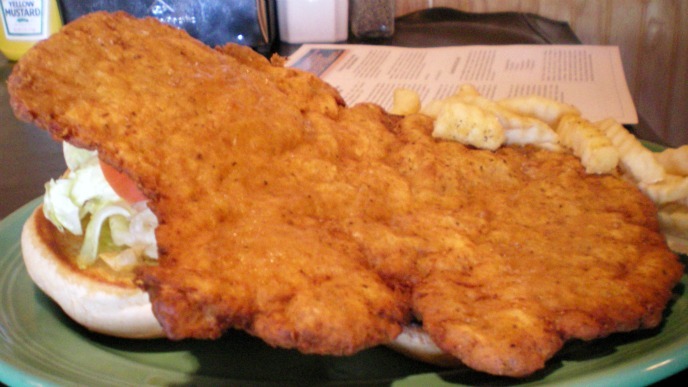 Its closer to Des Moines than most of the other roadhouses I have made it to for giant tenderloins, less than ten miles down the road from the main street in Norwalk. I don't think this sandwich is more famous the the MSM baseball team, but I think the small community is happy with both.